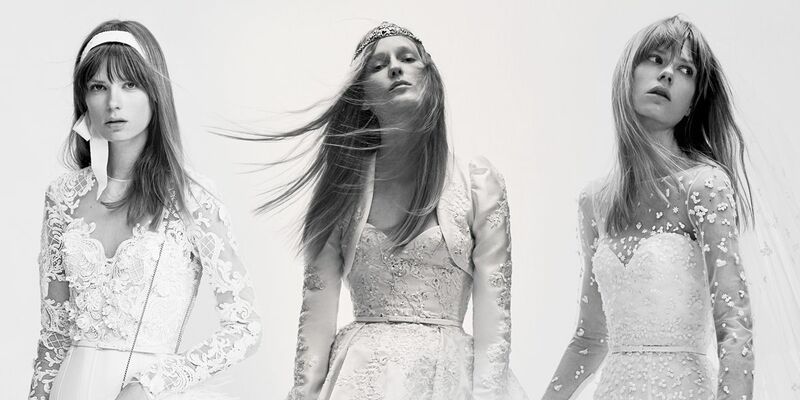 Elie Saab has unveiled a debut ready-to-wear bridal collection, Elie Saab Bridal. The Lebanese fashion designer, who is famous for his red carpet-worthy haute couture and ready-to-wear creations, has revealed a line-up of 25 daring and feminine gowns and trouser suits for brides to be. The contemporary collection features both fitted and grand dresses adorned with guipure, dotted tulle and silk chiffon. There are Grecian pleats, layered skirts and dramatic collars. Panels of lace offer coverage for semi exposed shoulders, legs and waistlines, with embroideries and draperies echoing the label’s penchant for intricate craftsmanship. Modern and minimalist brides are also catered for — the designer has reinterpreted the jumpsuit, through floral motif embroidery and graphic cuts with a layered, split skirt. There are also shorter dresses with tutu-style skirts for a more whimsical vibe. Matching veils, Swarovski crystal headbands, ballet slippers and clutches accompany the pieces. The line’s playful digital campaign is both romantic and lighthearted, focusing on the word “oui”, meaning “yes” in French. Self-made fashion designer Saab founded his own atelier in Beirut at the age of 18 and has since risen through the ranks to become one of the most revered haute couture talents in the industry. He moved into ready-to-wear in 2005 and developed his first signature perfume in 2011. Bridal gowns are not the only new project underway at the house at the moment — an eyewear collection is also set to launch in January 2017. The Elie Saab Bridal collection will roll out in October, although certain styles are available immediately in stores in Paris, Beirut, Dubai, Hong Kong and at Harrods in London. Prices start from €5,500.